This is indeed a very special post for StyleScrapbook and it gives me great pleasure to finally announce what I have been working on for almost a year! I have been a blogger for over 3 years now and my SLR camera has become my number one accessory as I have to bring it with me to most events. I searched for a stylish camera bag for ages, but not only any bag, but something that would match my style perfectly, but I couldn’t find it, that is why I decided to design one myself, so I partnered with very well known European brand Kipling and we made it happen! We have been working on this for so long and you have no idea how happy and proud it makes me to finally be able to show you my very own limited edition camera bag for Kipling, which is my very first collaboration as a designer and I am hoping for many more to come! This is all very surreal and exciting, so I am really looking forward to hearing your feedback and hoping that you love it as much as I do. For those who are interested, click HERE for news about when you can purchase my limited edition camera bag for Kipling. I want this bag!!!!!! please send me a msg where to buy it! Pleasee! Onde posso comprar e qto custa? ahhh this bag is amazing its so incredible i want one!!! how can i get one please?? its so stinkin adorable and perfect i want it!!! What are the guidelines for camera bags in the carry-on on a plane? I wanna one! Where can I buy it? Love the bag, very bling :) Excellent job! When is it out for sale? It's incredibly cute! I want it!!! When is it going to be available it's been 4 months now? The most chic camera bag I've ever seen. Hopefully it'd be available in Thailand also! OH MY GOD I NEED THIS!!!!! EVERYTIME I GO OUT WITH MY DSRL CAMERA I'M LIKE I WISH THERE WAS A STYLISH BAG FOR IT!!! Please kipling bring it to Brazil!!!!!! 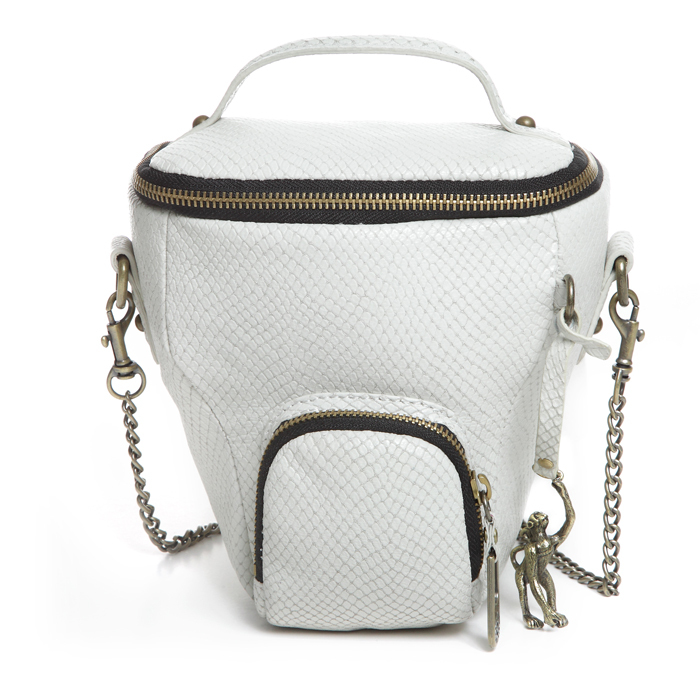 omg, so chic this fotocamera bag! I need one for mine too! A good option, Kisses, Alinnewww.alinnestyle.com. congratulations andy! so happy for you! OMG I love it, I want one!!!! POR FAVOR dime que saldra en estados unidos! es la bolsa mas preciosa que eh visto para una camara!Felicidades por ser una inspiracion! Tienes muchisimos fans aqui en Juarez Chihuahua! Un dia espero llegar a ser como tu! OMG you are a genius designer, I always wanted to find a trendy camera bag for a while. I use my Jaeger makeup bag as a camera bag hahahaha, it's good but I don't like the sharp zip teeth scratching the body and LCD screen of my camera.Good work.p.s nice to meet you at the My Wardrobe party. Thanks God, someone finally did it!! Somethimes I leave my camera at home, because it doesn´t fit anywhere nice. Thaks so much, I hope I can buy it from Brazil!!! OHHHHHH DEAR! !1 I NEEED, I WANT, I NEED SO MUCH THIS CAMERA BAG! !1 IT´S PERFECT, IT´S GORGEOUS!! I LOVE IT.KISSES ANDY.MUAKS. This is divine, Andy! I want me one of those… It is 100% stylish! Why does it look so SAD, cheer up little bag! Cool Now make it in black brown and burgundy to go with her shoes. Felicidades Andrea! el resultado es bellísmo, has hecho un gran trabajo.Acá donde vivo Kipling es muy costoso, tal vez un día vea tu diseño en las vitrinas :)Nos vemos linda! the bag is gorgeous! i hope it's not too pricey, i'd love to get one. donde la podemos conseguir aqui en Mexico?? porque obvio llegará hasta acá verdad? me ENCANTOOOO! Love, love, loooooove! Hope you also you can tell us where to purchase too and how much it will cost;) Please let the bag come to Norway! Will it only be available on the Internet? Gefeliciteerd Andy! Echt een supermooie tas, ik zou m ook dolgraag willen om mijn camera in mee te slepen! Congrats, Andy! This is so amazing as I've been searching for a good sized camera bag, which is also safe for my lovly, but everything I can find are these ugly black big bag I own masses of. No thanks. If it's in my price range and in a colour I like, I'll definitely get one of these! You did such a great job! OMG I have been looking forever for a gorgeous camera bag! Please do let me know when they are available! good job Andy, I would like to have this bag, it's lovely! Hey! Muchas felicidades!Hacía falta que alguien le pusiera un poco de estilo a la fotografía. Congratulation Andy! This "bag" it's awsome…I think you'll have luck as a designer! nice :) i want it! THANK YOU SO MUCH THIS IS THE BEST IDEA A FASHION BLOGGER HAS COME UP WITH IN A VERY, VERY LONG TIME. Dear Andy……love it, love it, love it…Finally a stylish camera bag…CONGRATULATIONS!I'm so happy for you!!!! Amazing!I want it!Where can I found it?? Hey Andy, I hope you don't mind, but I made a post about this fabulous item you designed!Here's a link if you want to check it out:http://blancsection.blogspot.com/2011/03/monkey-meets-iconic-blogger.htmlLove,Shanah. Love this bag. 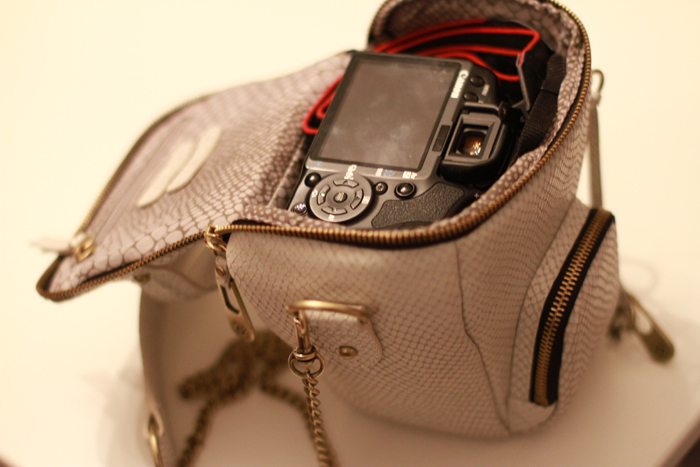 A stylish handbag and camera bag combined. OMG congrats!!! It looks so amazing! I love it! Congratulations. You have sold one to me for sure! omg so cool.. im so getting that bag! !andy we just love jou!! Congratulazioni !!! :)Spero che avrai successo! Sei davvero una ragazza dolcissima! Great design! love it! 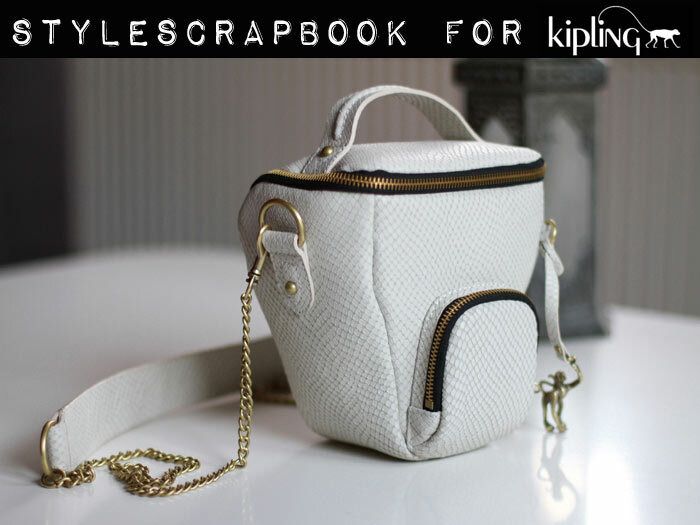 white leather, Style Scrapbook and kipling! Congratulations!! It's aweeeeeome Andy!!!! My camera would definitely love it :)Bisous. Betty. andy, muchisimas felicidades!en verdad que me da mucho gusto q te este iendo super bien, no cabe duda que el q tiene talento, definitivamente lo tienepd. quedo genial la bolsa! !1 yo quiero una! this is AWESOME! i hate carrying around a boring black canon brand camera bag. great idea! It's amazing. I love it and I can't wait to get my hands on one of these. wow. I LOVE IT. Great job. Well done. High five. Congrats. Where could I get one. It seems to be a must have !!! I LOVE THIS i can't wait until i can buy it!!!!congrats! That's so cool! It's really a beautiful bag, you did a great job! 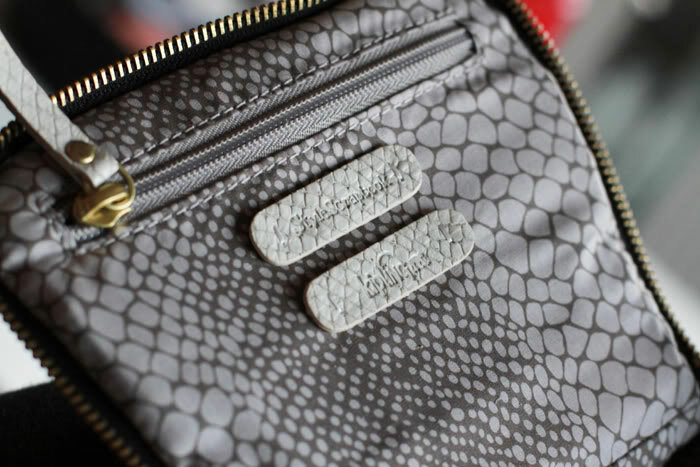 And as a Belgian girl, I'm proud to see you collaborated with kipling! My first camera bag (for a simple point and shoot when I was really young) was a kipling bag! It's amazing,Andy"I wanna buy a camera right now justo to use it! :-) I'm really happy for you even more because i 've been following up your blog for over a year and i really like the way you dress and have guiding your carrier. It's an inspiration for me. Thank you and Congrats. Hey Andy, please let us know where to get this stunning little thing. Congrats, looks wonderful. Kisses from Brazil. This is the most chic ingenious piece ever. The style of it is amazing and I will for sure be buying one. OMG!!!!!! I couldn't love it more!!!!!!!!!! !<3I want it so badly!!!!!!!!!!!!!!! Oh my … ! I need it !!! Congratultions! :) and I want it! Love this camera bag! I wish I could have this too! Q conveniente, ME GUSTA!!! ;) Seguro q voy a comprarlo! preciosa!he estado buscando algo asi pero no encuentro nada, encuentro horrible sla sfundas de las camaras, cuando , donde estara a ala venta? y que rpecio tendra? IT'S BEAUTIFUL!! !<3 Please let us know as soon as you can where we can buy it!!! I can't wait to get one of these – I've been looking for the perfect camera bag forever! Congrats!I wouldn't be happy with the bag myself though as I would not like all the weight on the lens. Best to rest the weight on the body! That's such an amazing oppertunity!! Congrats, it looks fabulous. It's actually the first Kipling bag that I like :P Love it Andy!! Andy this is AMAZING!Congratulations, you really deserve it! The bag its beautiful and this is a great accomplishment! Around how much to get one? :)I'm very interested. What a great opportunity was that!Very cool! Looks great! Hope it will be on sale soon. Might wanna get one for my new SLR. Andy, me dejas boquiabierta, eres increible!! Wow! Congrats! I would love to have a stylish and amazing bag like that for my camera as well! That looks amazing. Your right their aren't really any stylish camera bags out there. They should have you design one for powershot cameras as well since not everyone has an SLR…though those that do should appreciate this. Love it! Ben erg benieuwd waar hij te koop is straks en wat hij kost :-)! Great job! I loved everything about it. Since the idea of a camera bag until the final product. And I want mie now! Congratulations !!! Andy, I love it! I hope I can buy it from my country too! Perfect! Love the color and that gold chain. Perfect. U understand us bloggers :p M.
Andrea está fabulosa, la necesito comprar, ya la quiero. Muchas felicidades, espero que esto sólo sea la primera de muchas más colaboraciones, es de admirarse lo que has hecho y realmente es un accesorio que NECESITO para mi cámara, saludos desde Mexicali, Mx. it is for a fact the prettiest camerabag I've ever seen. Want it, want it! WOW!! I wouldn't mind carrying it around as a regular bag :) I love it!! AAAHH Andy, you're a GENIUS! Well done & huge congratulations! I'm in love with this camera bag, it's so handy and stylish. I wish I could buy it right now! It is so pretty !I hope I can buy it in Belgium soon !love it Andy ! The time spent on working was worth it. The bag is amazing and I will certainly buy it ! Is it big enough to fit the canon 5d??? congratulations! love it and can't wait for more of your projects! That is so legit!!! Awesome design Andy:D The most stylish camera bag I have ever seen! sooooo lovelyi want it soooo much ! QUERO UMA AGORA!!!!!!! PARABÉNS ANDY! FICOU PERFEITA! MANDA PARA O BRASIL POR FAVOR! HEHEHEHE ;P UM BEIJO GRANDE, TE ADORO!! LUIZA. Wow… very cute! I want one! Is there space for an extra lens? Oh girl I love it! You did an amazing job! This bag is perfect! Well done Andy!! I luv it!!! Congrats!!! !Can't wait to buy one! Saludos desde Ciudad de México!!! very cool..how much is it? congratulations!!! What a fabulous stylish camera bag, love it! Congratz! That bag is sooo stylish an pretty! you did a GREAT job!!! this is so cool…such a beautiful bag with a twist..
me encanta!!! !felicitaciones esta divino estoy my feliz por ti andy :)aleja. that is so gorgeous!xoxo,FLe Kiss Kiss- Click Here!! Wow! I love the bag :) Great job! When I saw the pictures , my first word was: Waaa!congratulations! and good luck for the next ones. that is great!!! looks so fabulous!! i wanna get one too!! 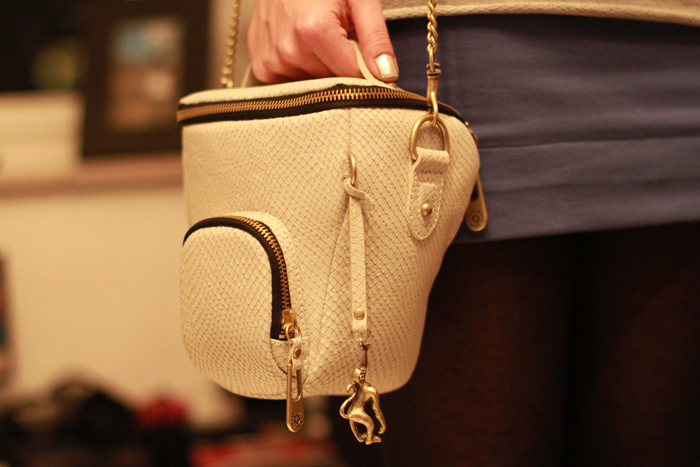 I am completely enamored with the camera bag. It looks so chic and sophisticated. Congrats Andy, it looks perfect! I can't wait to known when I can buy it, I've been needing a fashionable camera bag myself!http://www.TheFancyTeacup.commuch love. I love it . 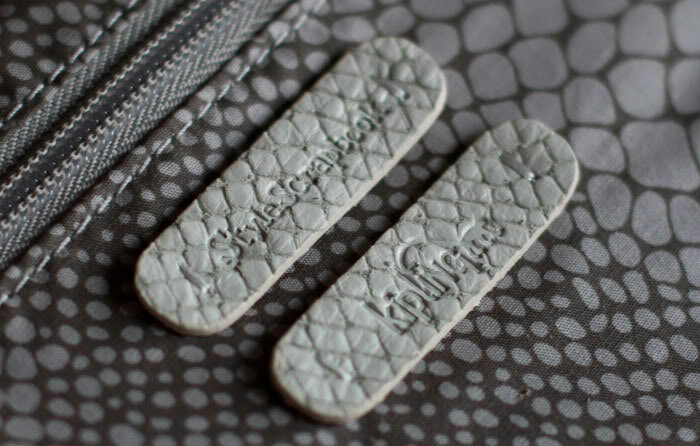 Do you know when it will be avalible at Kipling store/website? A must have item. LOVE IT love it love it. Love it Do you know when it will be avalible the kipling shop ? I must have one. I don't even have a camera, but I would love to have this gorgeous bag! Congrats! wouaaaahh it looks amazing!! what a good idea it is. Congratulations!! And it looks gorgous. That was a great idea for a design. Congrats. Sí!! es estupenda!! espero que comercialicen más (aunque nunca serán tan especiales como la tuya tan personalizada ;) ) porque todas las bolsas para las cámaras con horribles!! How cute is that! 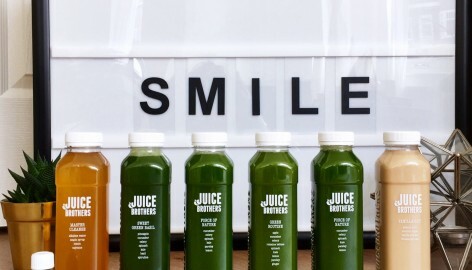 My congratulations for the original idea and the cool brand involved. I hope there's more than your name behind the concept and if it's so I'm glad you have this opportunity because you deserve it! http://definingvivante.blogspot.com/ congratulations..the bag is really pretty and can actually go with many things…good job by the way! wow, this is just amazing!! want it right now!! Wow! I was looking for a nice bag since forever, and this one is just perfect!! Hope it will be in afordable price cause this definitely is my new must-have! gorgeous Andy! I love it so much! this bag is really necessary! Love your blog, props from POLAND! Andy, I borrowed some photos of you wearing a striped blazer and posted them on my blog (all properly linked back to you), just thought I should let you know…www.babidayrell.blospot.comtks! Amazing!!! how can I get it???? http://WWW.RENEBRAUN.COMKisses! Por fin un bolso bonito para la camera, me gusta muchissimo! Wow, amazing!I´m speechless, I´m gonna buy me a new camera and one of these bags haha. Waw great job Andy !The traditional camera bag aren't relly fashionable !! !But this one is amazing !Please let us know when and where we can buy it !!!! I like your camera bag. It is very interesting idea! It is great and very stylish! Oh how exciting, and so truth I hate those stupid big camera bags, this one is so pretty! My jaw literally dropped and my heart skipped a beat. I was that excited when i saw this. I've been looking for something like this for my dslr. this is an extreme hot, mouth watering item. but then seconds later i thought to myself "this is going to be unfordable"? Wow, felicidades! Me encanta, yo quiero una, definitivamente nos tienes q avisar donde podemos comprarla y cuando. Well done girl! Okay, now I NEED to have that bag! I've always had a problem bringing my camera with me, but this bag is so stylish and functional, great job, Andy! what countries will this be available andy? Es ideal para las bloggers de la moda como todas nosotras!! Me encanta! It's amazing!! It completely fits your style and is so versatile at the same time! Partnering with Kipling is an honour in itself, and after this final product, Kipling must be proud to have partnered with you!Well done! this is amazing!! 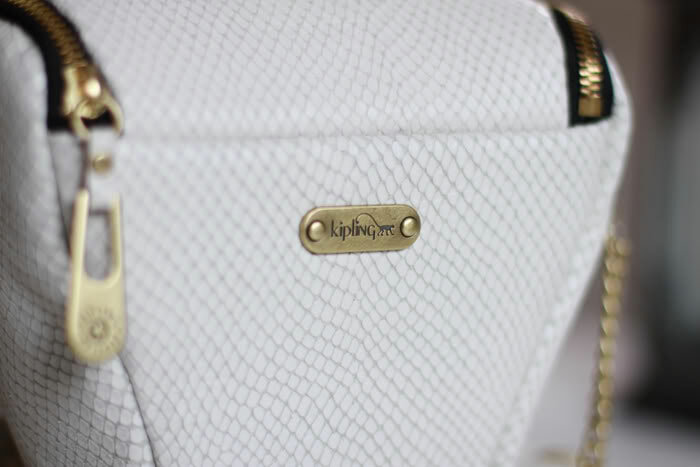 The bag is gorgeous!It is a dream come true for every blogger out there i think :)! I think it's wonderful idea! It's very necessary thing and this bag not only beautiful but also made with mind! Wow Andy, I LOVE it! Congratulations! I CAN'T WAIT !! I was also looking for the perfect bag for years now..
Thatis so cool!<3 …but love silver more than gold. That is one heck of a stylish camera bag! I want one! !You did a great job:DDiscover my Stylish Confessions!Discover my Stylish Confessions!Discover my Stylish Confessions! Love love love it! 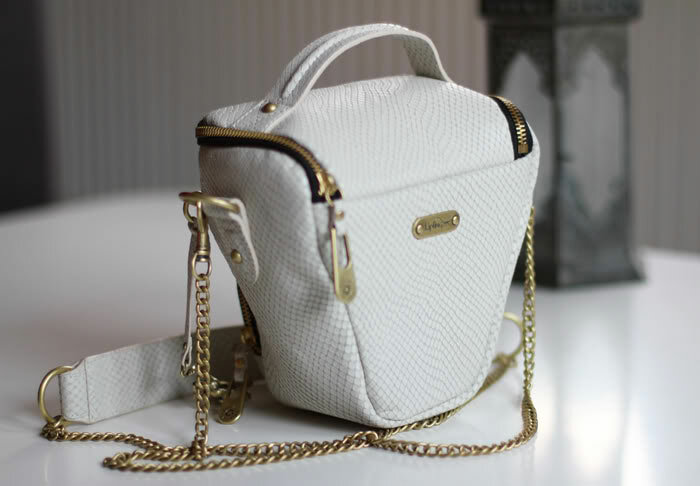 I have linked it to my friend who wants to be a fotographer, 'cause this bag is so amazing! Te sigo desde hace un montón de tiempo y la verdad… TE HAS SUPERADO! !Me encanta!!ENHORABUENA! Wow, Andy, real congratulations. Not only the bag is nice and good-quality, but I'm also so happy for you that you finally collaborated with some brand. There'll be more to come, don't worry, girl! Take care. amazing! finally a stylish camera bag! I definitely want one! amazingg.Hola Andy, soy de mexico y soy fotografa y siempre e buscado un estuche para camara bonit y nunca habia encontrado un! este estaa muyy bonito,me encanta!Porfa luego nos pones los datos de donde podemos comprarla ya que si me gustaria al fin tener algo bonito donde guardar mi camara!saludos y que tengas un buen dia :)Monica. Fantastic! Can I buy one!?! this is just so nice! congratulations to you! :) the bag is so chic, love it so much! Absolutely stunning, Andy! Fits your style like a glove. I'm waiting to hear more details about purchasing and to see your outfits featuring this amazing bag! WOW… I want it! Taking my SLR camera almost always feels like a burden. Now it sits in the smallest bag possible (kind of the shape you have designed because it's the most effective) but it's so ugly and not fitting any style. I feel like a tourist when I carry it around now. 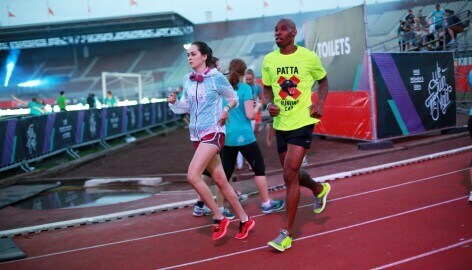 So I will definitely want one… it's gorgeous I'm from the Netherlands so I hope I'm able to purchase one?! Oh Andy this is so beautiful! it looks stylish, of quality and useful =) it is problem of us photohrapers to carry our cameras safe and sound but we just don't have any bag DECENT looking ahah =)you have to be proud of yourself! this is a great accomplishment for your career =)Hopefully one day you'll make a masculine line too?take care and cograts! amazing job! u are right!!! i need to get me one of those! this is soooooo pretty! You did an amazing job and really made something happen there! congrats! I am very much looking forward to getting my hands on one of these! Will there be other colors as well? Very cool!! I love this bag. wow! you must be so happy!! congrats!xxfashion illustrations at ILLUSTRATED-MOODBOARD. oooh waauw, this is AMAZING andy! For me as a photographer. I WANT IT!! congratulations!! !this is the prettiest camera bag i've ever seen!! i want!quick question, does the chain become painful on the shoulder after a while of wearing, since the camera is heavy? i'm interested in getting one! I love it, it's pretty!